The Mac can now make outbound voice calls to other Apple users that have an iPhone, iPad, iPod touch, or another Mac, using nothing but the native FaceTime Audio service. Built into Mac OS X, FaceTime Audio can be used to call any other FaceTime user, free, anywhere in the world, and it provides excellent audio quality for the voice conversation. Using FaceTime Audio in Mac OS requires MacOS or OS X 10.9.2 or later to be installed on the Mac, both on the caller and recipients end. If calling an iOS device, the iPhone or iPad will need to be running iOS 7.0 or newer to receive the call. Unlike the large screen that remains visible during an active FaceTime Video chat, FaceTime Audio calls use a small window for active conversations. Tapping the red “End” button is enough to hang up the call, or you can just quit out of the app. The audio quality of FaceTime Audio is quite good, though users with greater bandwidth available to them will likely enjoy the most clear conversations. If the Mac is calling an iPhone user with FaceTime Audio, the call quality will depend considerably on the recipients cellular reception, so like most other VOIP clients it’s best used when on wi-fi (not to mention to avoid the potentially heavy data use). Of course, FaceTime Audio goes both ways, so with the newest version of Mac OS installed on the Mac, it can also receive inbound phone calls using the service. 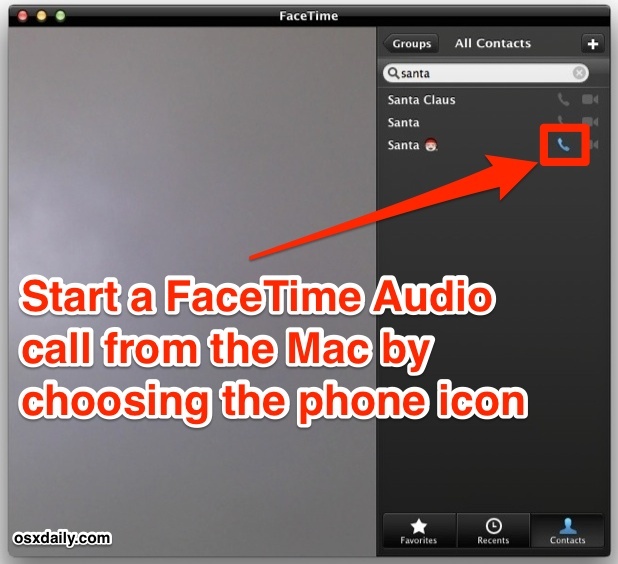 You can test this yourself by initiating a FaceTime Audio conversation from an iPhone or iPad to your own Mac. While FaceTime Audio is restricted to the more recent versions of Apple’s operating systems, users who are unable to run Mac OS X 10.9.2 or iOS 7 can continue to use Skype and Google Voice, both of which continue to provide for free direct VOIP services to anywhere. Both apps are worth checking out anyway, particularly because Skype and Google Voice allow users to make phone calls to actual phone numbers, rather than just other FaceTime users.